This was the last season that the NFL was divided only into two separate conferences, and only one postseason round was played between the two conference champions. The season concluded with the first Super Bowl; the NFL champion Green Bay Packers defeated the AFL's Kansas City Chiefs 35–10 at the Los Angeles Memorial Coliseum on January 15, 1967. The NFL awarded an expansion franchise to the city of Atlanta on June 30, 1965. Commissioner Pete Rozelle granted ownership of the Atlanta Falcons to Rankin Smith, Sr. and they were awarded the first pick in the 1966 NFL Draft, as well as the final pick in each of the first five rounds. The league also provided the Falcons with an expansion draft six weeks later. On June 3, 1965, the NFL announced its plans to add two teams in 1967. four days later on June 7, the eight franchises of the rival American Football League (AFL) voted unanimously to add two teams in 1966, an AFL franchise was awarded to Atlanta the next day. The competition with the AFL for Atlanta forced the first to be added a year early. The odd number of teams (15) in 1966 resulted in one idle team (bye) each week, with each team playing fourteen games over fifteen weeks (similar to 1960: twelve games over thirteen weeks). The second expansion team, the New Orleans Saints, joined the NFL as planned in 1967 as its sixteenth franchise. Scheduled byes in the NFL's regular season did not return until 1990. 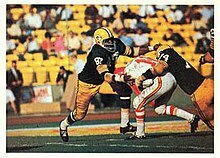 The AFL had originally targeted Atlanta and Philadelphia, but its two expansion teams became the Miami Dolphins in 1966 and the Cincinnati Bengals in 1968. Goal posts were standardized in the NFL. They were to be 3–4 inches (7.6–10.2 cm) in diameter, painted bright yellow, with two non-curved supports offset from the goal line, and uprights 20 feet (6.1 m) above the crossbar. In 1967, the new "slingshot" goal post was made standard, with one curved support from the ground. In 1974, the goal posts were returned to the end line, and the uprights were extended to 30 feet (9.1 m) above the crossbar, and to 35 feet (10.7 m) in 2014. The new goal-post rule is often referred to as the "Don Chandler Rule", referring to the placekicker for the Green Bay Packers. Although widely denied, the height increase of the uprights was in reaction to the previous season's Western Conference playoff game at Lambeau Field in Green Bay. Chandler kicked a controversial field goal that tied the game with under two minutes remaining. The kick was high above the upright, and many spectators thought that the kick missed. Chandler later hit a field goal that defeated the Baltimore Colts in overtime. The following week, the Packers defeated the Cleveland Browns in the NFL Championship Game, their first of three consecutive league titles. St. Louis opened new Civic Center Busch Memorial Stadium in 1966. In the Western Conference, Green Bay's first loss was in Week 5, falling 21–20 in San Francisco to tie them with the Rams. The Rams lost 35–7 to Minnesota the next week, and Green Bay stayed in front until Week 9, when Minnesota beat them 20–17. Baltimore's 19–7 win over Atlanta briefly tied it with the Packers at 7–2–0 in Week 10, but the Colts lost to Detroit the next week, 20–14. The Packers clinched the title in Week 13. In the Eastern Conference, the St. Louis Cardinals took the early lead, winning their first five games. (The Dallas Cowboys were also unbeaten, but due to a bye in Week One, they had played one fewer game and thus were a half-game behind the Cardinals in the standings.) The unbeaten teams met in Week 6, and both were still unbeaten after they played to a 10–10 tie. However, both teams suffered their first defeat the next week, with St. Louis losing at Washington, 26–20, and the Cowboys falling in Cleveland, 30–21. In Week 9 (November 6), St. Louis beat the Giants, 20–17, while Dallas came up short in a 24–23 loss to the Eagles. The next week, Dallas won at Washington 31–30 on a field goal with 0:15 left, while the Cards fell at Pittsburgh, 30–9, cutting their safety margin to a half-game again. St. Louis had a bye in Week 11, and a 20–7 Dallas victory over Pittsburgh gave the Cards and Cowboys records of 7–2–1. Both teams won the next week, setting up the stage for their December 4 meeting in Dallas during Week 13. The Cards took a 10–7 lead in the first quarter, but Dallas won 31–17 to take over the conference lead. In Week Fourteen, Dallas hosted Washington, and lost 34–31 on a field goal at 0:08. The Cardinals were in a must-win game against what should have been an easy opponent, the new (2–10–0) Atlanta Falcons. Instead, the Falcons notched their third win and virtually ended St. Louis's hopes to go to the title game. The St. Louis Cardinals, who lost again the next week, never got that close to the Super Bowl again before moving to Phoenix in 1988. A bye week was necessary in 1966, as the league had an odd-number (15) of teams; one team was idle each week. The sixteenth team (New Orleans) joined the league in 1967. The 1966 NFL Draft was held on November 27, 1965 at New York City's Summit Hotel. With the first pick, the Atlanta Falcons selected linebacker Tommy Nobis from The University of Texas. Atlanta Falcons: Norb Hecker became the expansion team's first head coach. Los Angeles Rams: Harland Svare was replaced by George Allen. St. Louis Cardinals: Wally Lemm was replaced by Charley Winner. Pittsburgh Steelers: Mike Nixon was replaced by Bill Austin. Washington Redskins: Bill McPeak was replaced by Otto Graham. ^ Minter, Jim (July 12, 1965). "The mayor surrenders Atlanta". Sports Illustrated: 14. ^ "NFL ready to expand – AFL, too". Milwaukee Sentinel. Associated Press. June 4, 1965. p. 2, part 2. ^ "No-holds-barred war set by grid leagues". Rome News-Tribune. (Georgia). Associated Press. June 9, 1965. p. 11. ^ a b Hackleman, Jim (June 20, 1965). "Pro football leagues duel over juicy Atlanta plum". Spokesman-Review. (Spokane, Washington). Associated Press. p. 4, sports.